Heart disease is still the #1 killer of men over 50. At 40 years old and above, it’s time to stop thinking you are invincible and pay attention to yourself (and your doctor – if you see him or her.) Hypertension doesn’t only contribute to heart attacks but can cause kidney damage, eye problems and strokes. To minimize your risk of hypertension, lose that gut! It’s true, losing the abdominal girth can really make a HUGE difference in your numbers and help prevent other serious matters. What’s a normal blood pressure? 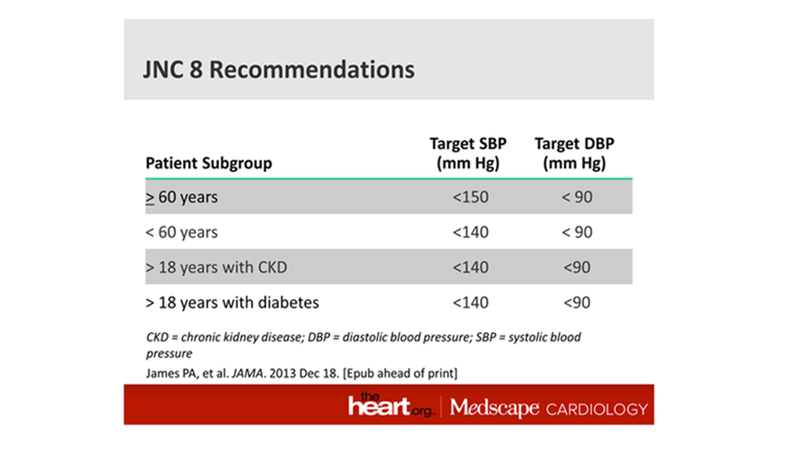 Recently, the powers that be (the Joint national commission on hypertension), have made new recommendations for blood pressure– see chart to the left. If you have high blood pressure, concerned you may have it, I will suggest you pick up a blood pressure machine at your local pharmacy or electronics store, start measuring it, keep a journal and bring it in with you to show your doc at your next visit. TIP: The more accurate machines are placed on your arm not your wrist. Bring your machine to your visit. They will compare your machine and their machine. If your readings are close but your home readings are much lower you may get the diagnosis “white coat hypertension” aka: nervous during doctor visits syndrome. Don’t worry, this is normal!